The second and last total lunar eclipse of 2015 as seen from Canada will occur on the night of September 27. Unlike the previous one in April where the west coast and central North America witnessed most of the eclipse, this event is favoured in the east. First contact or when the full Harvest Moon begins to slide into the Earth's shadow occurs at 9:07 p.m. EDT. 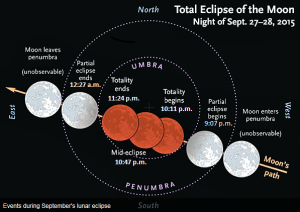 Mid eclipse will be at 10:47 p.m. EDT with the celestial show ending at 12:37 a.m. EDT. A total lunar eclipse is a very safe and awe inspiring event. During mid eclipse the moon turns copper orange as sunlight refracts through Earth's atmosphere much like a deep red sunset. This will be the last of four consecutive total lunar know as a tetrad. A partial eclipse is slated for 2017.